Handmade organic soap is a must for all; whether you are someone who is obsessed with the best skin care products or not. There are some of us who are particular about our beauty regime while others pick the cheapest products they can find without a second thought. No matter what applies, using organic soap should be the number one rule of your skin care routine, and it’s not a change that is difficult to implement. Of course, you can walk into your local supermarket and find an abundance of soaps to choose from. However, the majority of these products are made to get the job done, and there is little consideration for the consequences. 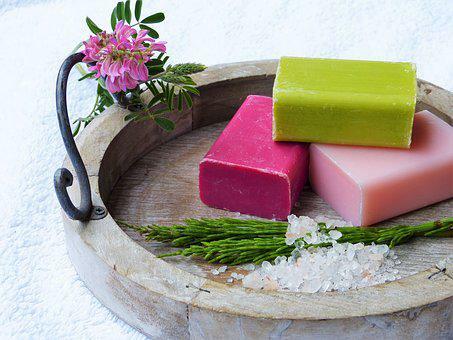 So, let’s take a look at why natural handmade soap is the better choice. Firstly, no harsh chemicals will be used, such as sodium Laureth Sulphate and Parabens. Does this really sound like the sort of stuff you want to be cleansing in? Instead, 100 per cent natural ingredients are used. This is especially important if you have a skin condition like psoriasis. The psoriasis symptoms Inspire talks about will only be made worse with commercial soap. Secondly, from shea butter to Jojoba oil, these natural skin care products have powerful skin treatment properties. They can assist with everything from treating acne to reducing the appearance of wrinkles. Thirdly, handmade soaps are better for the environment, as all ingredients are natural. Mass produced soaps are filled with chemicals that will eventually pollute our rivers and such like. Fourthly, handmade soaps will deliver a rich dose of antioxidants that will ensure your skin is well protected. Finally, these products are works of art; they look and smell amazing, making them a real pleasure to use. Artisan soap has become increasingly popular over the past few years. In fact, you may have purchased this type of soap without even realising. After all, when we talk about soaps, we tend to only consider two types – handmade soap and commercial soap. Nevertheless, there is a third category, and below we will explain more about artisanal soap. Essentially, artisan soap is a form of handmade soap. These soaps are extremely creative; their designs and their ingredient composition are guaranteed to amaze. They have been crafted by specialists who bring in organic or food-grade ingredients to ensure the most skin-friendly results and luxurious cleanse. It is fair to say that artisanal soaps are the best on the market. If you want to add a lavish touch to your skincare routine, this is the type of soap you should be looking for. These soaps are often made with the likes of goat’s milk, extravagant oils, and clays. You can also get super-fatted soaps, which means that are made with extra butters and oils. With artisan soap, you not only benefit from all of the vitamins and nutrients your skin needs, but the cleansing experience itself becomes an extremely enjoyable one. Nevertheless, whether you purchase artisan soap or not, it is vital to ensure you only consider natural skin care products. Mass produced soaps and other products can be more like a detergent, as they are filled with chemicals and synthetic ingredients. Do you really want to put this on your skin?